But the piece of sporting equipment that might have helped tee off Ng's career is her golf club. Former White Sox and Dodgers general manager Dan Evans, one of Ng's mentors, recalls a particularly revealing round she played a few weeks into her first job in baseball in the early 1990s. It was during spring training and White Sox staffers were picking teams during a golf outing. Ng, as she has been many times throughout her career, was the only woman in the group. "She was drafted by a member of our field staff. The other guys all laughed and said, 'Oh, we don't even know this girl,'" Evans recalls. "I was thinking, 'I know she can play golf. She wouldn't hit from the women's tee. She only wanted to hit from the men's tee. And she held her own and played very well. "A lot of people went, 'Whoahhhh!'" Joe Torre, MLB's executive vice president for operations and Ng's boss, says she has all the qualifications necessary to be a GM -- broad experience in both the boardroom and the negotiating room, top-notch communication skills, a deep knowledge of the game and the drive to handle a demanding schedule. And then there's that fire she showed on the golf course. 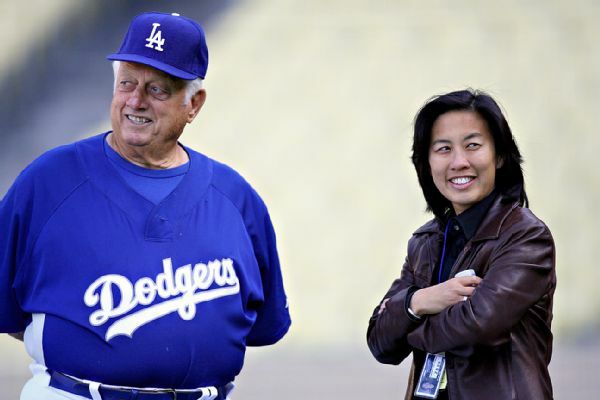 Ng became the first woman to interview for a GM opening when she did so with the Dodgers in 2005, but she didn't get the job. As Evans, Torre and others will attest, she clearly has all the experience, knowledge and skills necessary for the position. The question is whether a baseball team will finally allow a woman to hit from the men's tee. Ng is not only a rarity in baseball's upper echelon because she's a woman. If she lands a GM job, she'll also be the first Asian to do so. Ng's father, Jin, was born in America of Chinese ancestry. Her mother, Virginia Cagar, was born in Thailand and also is of Chinese descent. Ng was born in Indianapolis but grew up in Queens and then New Jersey, rooting for the Yankees and Thurman Munson because, she says, "he was an incredibly gritty player." Ng still has the scrapbooks in which she pasted new stories about the catcher's death. Ng's father was a financial analyst. Her mother earned her MBA while also raising her four daughters and later worked as a banker for Manufacturers Hanover Trust after Jin died when Kim was 11. At age 29, Ng became the youngest person -- and one of only three women -- to hold an assistant general manager position, when she was hired in that capacity by the New York Yankees. Ng calls herself a product of Title IX; in fact, she wrote her college thesis on the landmark law. And that thesis -- as well as the effect that playing sports had on her -- played a significant role in following her passion to pursue a career in sports. "The more you play sports, the more you understand about yourself, the more you get a picture of what you can do,'' she says. "Everyone talks about how sports are beneficial and how they force you to test and challenge yourself, going up against adversity -- all the clichés. But they're true. And for girls to experience sports the way boys experienced it was incredibly important. It was important for their growth not just in academics, but in their work lives and personal lives. She quickly proved herself a skilled negotiator, too. One of Ng's early triumphs was arguing for the White Sox in their arbitration case with pitcher Alex Fernandez and agent Scott Boras. Going up against Boras in a salary case is a little like batting against current Dodgers ace Clayton Kershaw with shadows creeping in front of the mound. Nonetheless, Ng -- who was both the youngest executive, at age 26, and the first woman to present a salary arbitration case -- won. Ng rose to become assistant director of baseball operations with the White Sox before being hired away by the American League offices after the 1997 season to serve as the director of waivers and records. At the league office, she approved all player transactions and contracts, and helped AL general managers interpret and apply MLB rules. The job allowed her to meet and network with baseball's power brokers, including Brian Cashman, who was then the Yankees' assistant GM. Cashman, who hired her a year later -- making her, at age 29, the youngest assistant GM in MLB at the time -- says now he offered her the job simply because "she was the best-qualified person.'' She helped Cashman build a team by successfully negotiating the contracts of Derek Jeter, Mariano Rivera and Paul O'Neill, among others, which won three World Series championships in four years. In 2002, Evans, then the Dodgers' GM, lured Ng away from the Yankees to become L.A.'s vice president and assistant GM. She also served as the franchise's interim director of player development, which meant she oversaw the Dodgers' minor league system and added scouting and player development to her portfolio. She handled it deftly, too. The Dodgers were named the 2006 Organization of the Year by Baseball America. 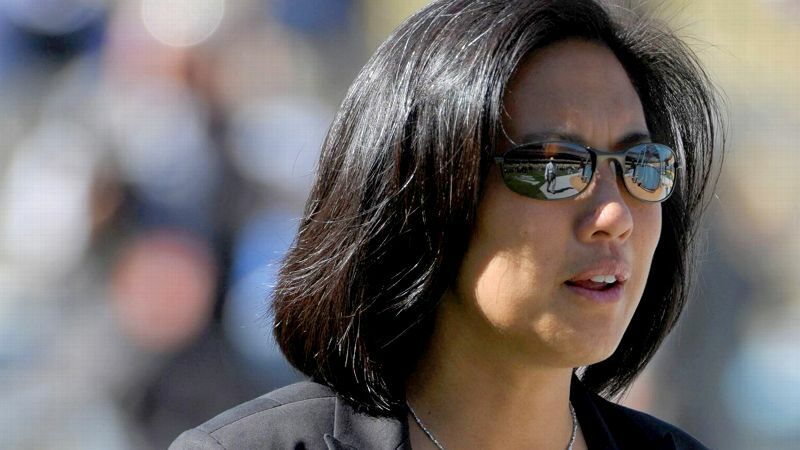 Ng still itched to help shape the game on a larger level, so she left the Dodgers in 2011 and moved to MLB's headquarters, where she oversees international operations as well as the league's scouting bureau and the fall league. She travels regularly to the Dominican Republic, Puerto Rico, Venezuela and other countries to help develop the game -- and her influence within the game continues to grow. Ng hasn't given up on her goal of landing a GM job. She lost out to Ned Colletti with the Dodgers in 2005, Jack Zduriencik with the Mariners in 2008, Jed Hoyer with the Padres in 2009, Jerry Dipoto with the Angels in 2011 and A.J. Preller with the Padres last year. Ng's baseball acumen has impressed everyone from Tommy Lasorda to George Steinbrenner. "She spoke the language, she seemed very knowledgeable in terms of how a baseball person would look at stuff she was talking about," says her boss, Joe Torre. Given Seattle's performance under Zduriencik (only two winning seasons and no finish higher than third place in seven seasons) or San Diego's under Preller (another losing -- and far more expensive -- campaign this year), perhaps the Mariners and Padres are having second thoughts about passing on Ng. While there are a handful of female GMs in the minor leagues -- including Kattie Meyer, who served in that capacity for the Rookie League Great Falls Voyagers for four years -- it's a a different job at that level, where the focus is more on business operations than acquiring and evaluating players. So why exactly hasn't she gotten the opportunity yet? Or it could be simply that she simply hasn't been in the right place at the right time -- yet. "There are only 30 GM jobs,'' Bowden notes. "You go to a local fast food place and there are 30 people working there alone." For her part, Ng remains philosophical -- and hopeful. "There are a lot of things in this world that are a lot more unfair [than me not getting a GM job]. It's hard for me, given that fact that I've been an assistant GM for 13 years and hold the job that I have now, to say that being a woman has held me back,'' she says. "I think that having a woman as a GM would certainly be a novelty. Having a woman as an assistant GM was a novelty for a while. So I think it's going to take time. "I've interviewed for several positions, but I can name a lot of other people who have been interviewed for the same number [of openings] or more and they still haven't gotten one. I'm just a little different, so people tend to focus on me. "If it comes, it comes; then that's great. And if not, I'll just keep plugging away."